What Makes a Coral Reef? Coral reefs are made of calcium carbonate, or limestone, that is deposited by coral polyps, the living animals inside of a coral reef. Although many corals look like plants, they are in fact animals belonging to phylum Cnidaria (the same phylum as jelly fish.) 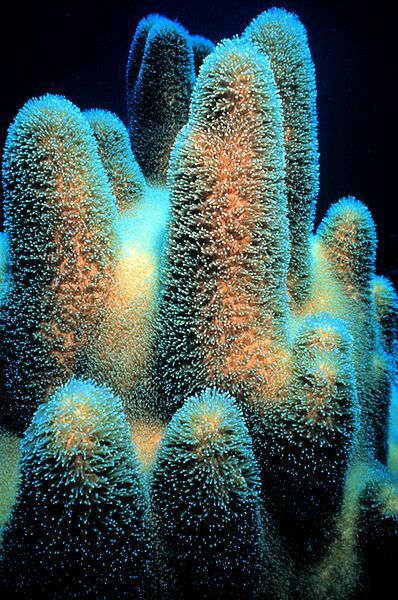 Corals that build reefs are called hermatypic corals, while those that do not build reefs are called ahermatypic corals. Examples of ahermatypic corals are soft corals, black corals, gorgonians, precious corals. Alaskan’s cold waters have many species of ahermatypic corals. 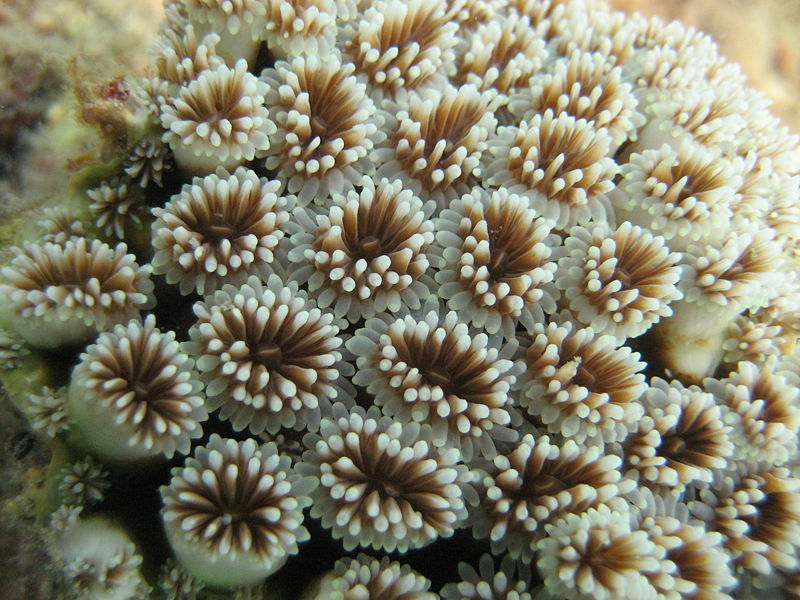 Most hermatypic corals have zooxanthellae algae living symbiotically inside of the coral polyps. Most ahermatypic corals do not have algae. Zooxanthellae are unicellular, yellow-brown (dinoflagellate) algae which live symbiotically in the gastrodermis of reef-building corals. The zooxanthellae provide a large input of nutrients that make it possible for the corals to grow and reproduce quickly enough to create reefs. Zooxanthellae provide the corals with food in the form of photosynthetic products. In turn, the coral provides protection and access to light for the zooxanthellae. Coral polyps can also obtain nutrition through eating. Coral polyps have long coiled tubes attached to the walls of their gut which can be extruded to grab and absorb food. Click to watch a coral polyp eating. Although corals are found throughout the oceans of the world in polar and temperate waters, as well as in the tropics, it is only in the tropics that reefs are developed (i.e., hermatypic corals are only found in the tropics). Coral reefs grow best in clear, shallow waters that remain above 18°C. Reefs are, therefore, only built in shallow tropical waters. Reef building is favored by clear water, and can be adversely affected by sedimentation. Corals have a ciliary-mucus mechanism which traps sediment and removes it, but that mechanism can be overwhelmed resulting in smothering of the coral. In general, coral reef development is greater in areas that are subject to strong wave action which provides a constant source of fresh, oxygenated water and prevents sediment from settling on the colony. (image from Arkive.org ) Click here to learn more about coral reef formation. temperature: are only found in waters bounded by the 20°C isotherm, and cannot develop below 18°C or above 30°C. depth: cannot develop in water deeper than 50-70 m, and usually grow in 25 m or less; this is why reefs are restricted to the margin of the continents or islands; due to light restrictions, as sufficient light must be available to the symbiotic zooxanthellae in the coral tissue for photosynthesis. salinity: are intolerant of salinities deviating from that of normal seawater (32-35 ppt); thus are not found where inshore waters are subject to continuing influxes of freshwater from river discharge. exposure to air: can secrete mucus to prevent desiccation, but are killed by long exposure to air. Fringing Reef – A fringing reef is either attached to, or closely borders, adjacent land. There is no lagoon between the reef and the land. It typically has a flat upper surface, up to 1 km wide, and plunges steeply into deeper water at its seaward edge. 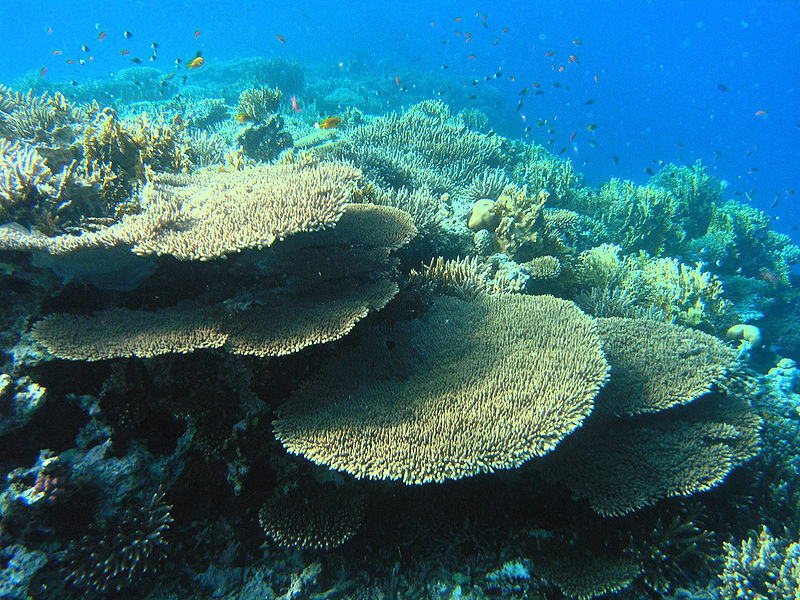 Click to learn more about the different types of reefs and their formation. Atolls – Atolls are roughly circular reefs enclosing a shallow lagoon. Some atolls have a central island. Atolls are formed as fringing reefs around a central island. As the island is eroded, the reef becomes a barrier reef, and the central lagoon gets broader, until the island is eroded to sea level, forming the atoll. This theory was first proposed by Charles Darwin. Some atolls, however, are growing in 4000 to 5000 m of water, so the island must have subsided considerably. Subsidence of this degree requires a explanation on the scale of plate tectonics, which is the case. Consider a volcanic island that emerges above sea level near a mid-ocean ridge. After it becomes extinct, it will slowly be eroded down to sea level. Plate tectonic movements take the volcanic island away from the ridge into deeper waters, forming a flat-topped submarine rise, known as a guyot. Darwin believed that the fringing reefs, barrier reefs, and atolls of volcanic islands represented a successional series through geologic time. He hypothesized that the transition from fringing to barrier reef to atoll could result from the upward growth of coral on the edge of a gradually sinking volcano. Gradual subsidence and continuous reef growth were fundamental to his theory. He believed that barrier reefs represented an intermediate stage between fringing reefs and atolls, and that the ring-like appearance of an atoll with a central lagoon resulted from the total submergence of the summit of a volcano. The sequence of events in atoll formation can be summarized as follows: (1) an emergent oceanic volcano that is no longer active, is colonized by reef-building corals; (2) initial coral growth forms a fringing reef around the island. As the magma chamber of the volcano is depleted the island begins to sink, but coral growth continues, building upon past generations of corals; (3) as the volcano continues to subside, a barrier reef is formed with a lagoon between the island and the reef; (4) finally, the volcano completely disappears below sea level, leaving an atoll composed of low coral islets in a ring with a lagoon in the center. To learn more check out the explanation of atoll formation – Wikipedia. Coral reefs are ecologically important ecosystems that have a high biodiversity. Coral Reefs are home to over 25 percent of all marine life and are among the world’s most fragile and endangered ecosystems. In the last few decades, over 35 million acres of Coral Reefs have been obliterated. Reefs off of 93 countries have been damaged. Disturbances affecting coral reefs include human caused and natural events. Recent accelerated coral reef decline seems to be related mostly to human impacts – overexploitation, overfishing, increased sedimentation, and nutrient overloading. Natural disturbances which cause damage to coral reefs include violent storms, flooding, high and low temperatures. When corals are stressed by high temperature, ultraviolet light, or other environmental changes, they lose their symbiotic algal cells and appear white (the white skeleton is actually visible through the transparent tissue). Depending on the intensity and duration of the stress, the corals may recover or die. Click here to watch a coral polyp bleaching in real time. As always, you may find your textbook to be very helpful with these questions. You can learn about coral reefs in chapter 14. Use the NOAA data Portal, Level 1,describe where in the world reef building (hermatypic) corals can be found. Briefly describe the differences between the three types of coral reefs (fringing, barrier, or atoll.) Sketch a picture of, or write a description of each type. Sketch an image of the Coral Polyp. How is it that coral is not just an animal, but really animal, vegetable, and mineral, all three in one? This YouTube clip might also be helpful. Describe what things reef forming corals need to survive. Describe the advantages of the symbiotic relationship between coral and zooxanthellae. Be specific to the advantages to both organisms. Explain how coral’s mate, and while they are doing so manage to spread their offspring over a wide geographic area. Read a bit about deep sea corals. Describe one thing you learn about deep sea octocorals. Also, examine a map of known deep sea corals, do we have any in Alaskan Waters? Coral reef bleaching has become a terrible problem in the world tropical oceans. What is it? What causes it? Examine the data for Micronesia, has there been any coral reef bleaching events in the last two years? Cuba has managed to maintain one of the worlds most intact coral reef ecosystems. How have they done it and what are some of the key species to benefit from Cuba’s decisions?